Budapest is an incredibly fun city, both by day and by night with loads of sight seeing to be done and crazy ruin bars to enjoy several drinks in. But what really surprised me when I visited earlier this year was the food! It’s not the kind of place that I would have thought to visit for the restaurant scene, and someone had even told me that the food was the least favourite part of their trip when they visited. But every single meal I had during my long weekend in Budapest was excellent. If you’ve read my recent post about how I spent my birthday in Budapest, you’ll already know that I had an incredible lunch of roast goose on my first day at a traditional Hungarian restaurant called Fekete Holló Vendéglő. It was proper comfort food, so full of flavour and so satisfying, especially when accompanied by a bottle of Hungarian wine. It also beautifully set the scene for how we would be eating for the rest of our trip! 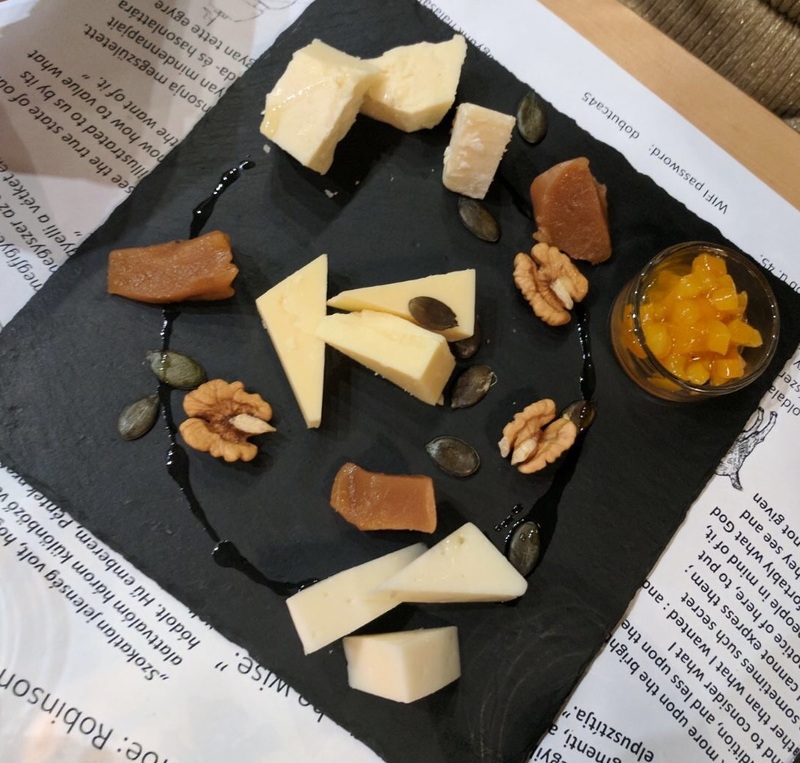 Which leads on to the main point of this post: to rave about one particular meal that we had, at an amazing restaurant called KönyvBár. We originally walked in to a different restaurant which we had passed earlier on our way to the hotel and advertised live jazz music (Billy and I have a soft spot for jazz on holiday). Unfortunately when the musician started up shortly after we had been handed menus and told that the dish that had caught my eye from the menu outside had sold out, the musician’s singing was so awful that we had to leave. It honestly put us both of our food! I wonder if she’s knows that she lost the restaurant business that night, and probably not for the first time!? 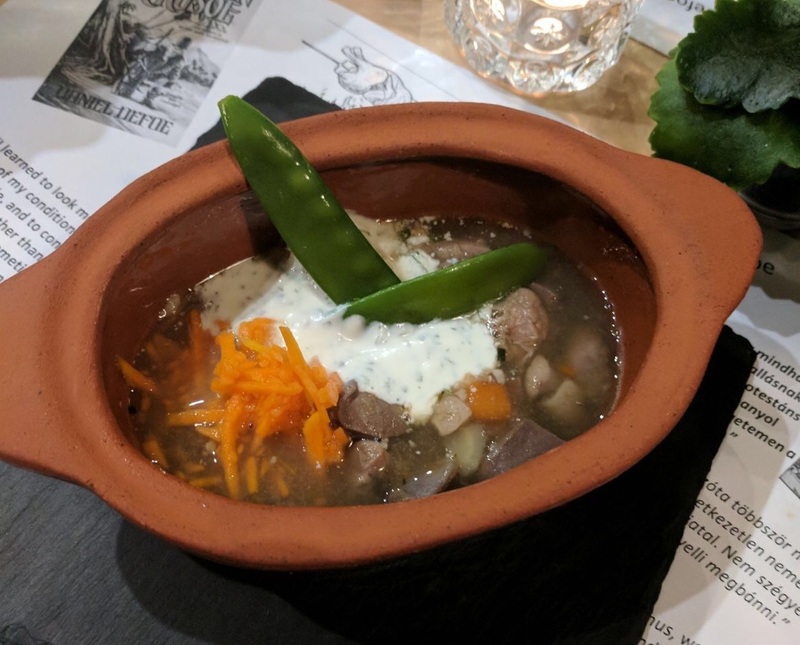 But it was all for the best because we stumbled upon KönyvBár a few doors down and, upon asking for a table, were told that there had just been a cancellation (a reservation is usually necessary). The first thing that struck us was the interior which felt really cosy and welcoming, and had walls lined with books. 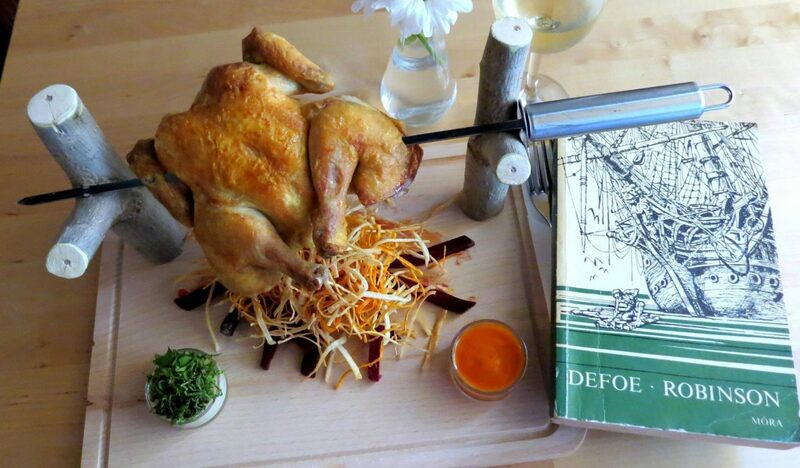 The idea of this restaurant is that each week a set menu is themed around a book, and this week it was Daniel Defoe’s Robinson Crusoe. You can either choose the set menu or select from the à la carte menu, but of course we went for the themed set menu with wine pairing – definitely the right decision. 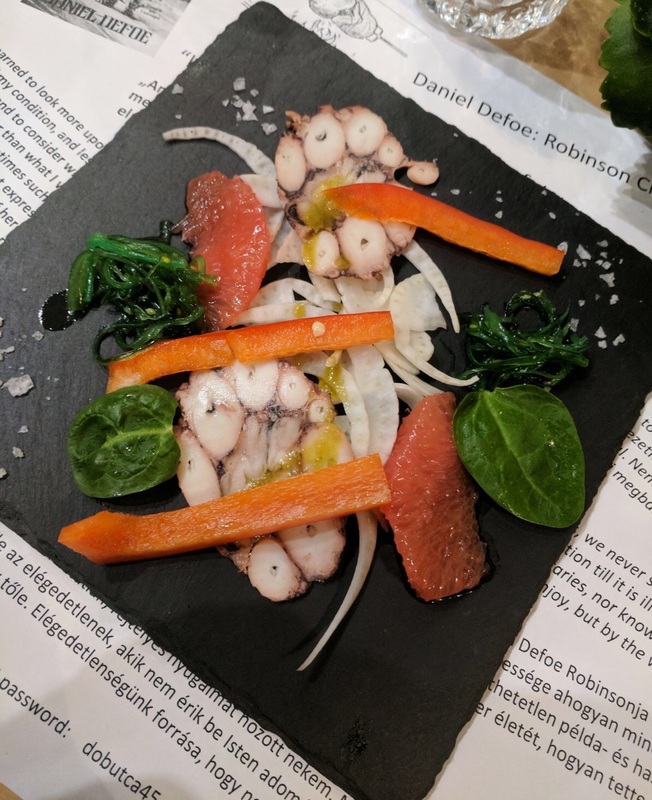 Representing the sea, our first course consisted of octopus carpaccio with ginger, grapefruit and a wakame salad. Each of the flavours and textures perfectly complimented each other in this delicate and refreshing starter. Our second course was duck soup with rosemary, pickled pumpkin and sour cream. To be honest I don’t usually go for soups as I get bored eating them, but there was so much going on with this one and I devoured every mouthful! The duck was so tender and there was loads of it. This was absolutely the best course of the meal! 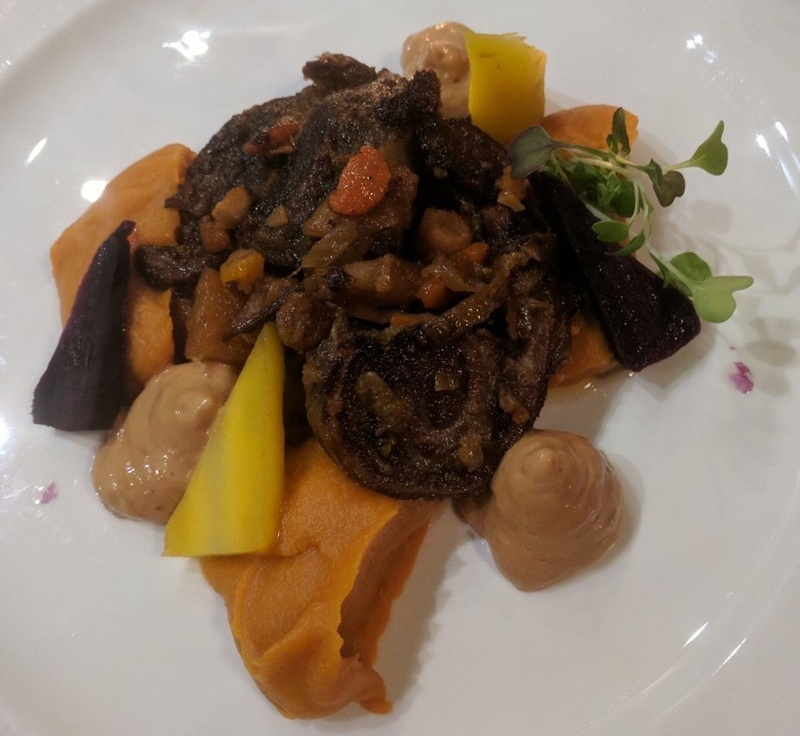 We had goat with sweet potato, carrot, and some sort of puree which tasted unreal. Whenever I’ve had goat before the bones have annoyed me, but this must have been a totally different cut and was just pure, delicious, melt-in-your-mouth meat. By this point I was starting to feel a little full but I didn’t let that stop me from pretty much licking the plate clean when no-one was looking. My favourite thing about this course was the presentation, which was really well done! It was roast baby chicken, shoestring veg, beetroot, chilli mango sauce and spicy yoghurt. Luckily after worrying I wouldn’t be able to eat any more after course 3, I got my second wind and once again ate every last bite. 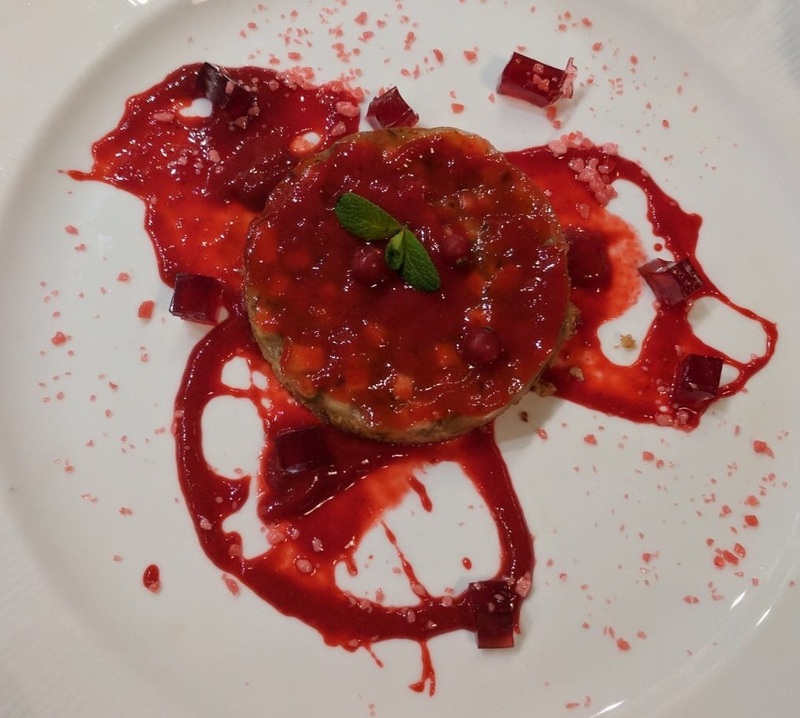 The final course is supposed to be apple pie with raspberry sauce (I think it’s the red sauce that gives it the name of Cannibal Feast), but I’m allergic to a lot of fruit so was given a cheese board instead. By this point I really was full to bursting but our waiter kindly boxed up my cheese to enjoy later, and boy did I enjoy it! Billy still had the Cannibal Feast and reported that it was also very good. Not only was the food incredible and the portion sizes seriously generous, the service was also outstanding. Our waiter was constantly on hand to talk through each course, and when we finished our glass of paired wine (which the waiter was very knowledgeable about) before our food we were always topped up. Everything about this place really was perfect, including the price tag (it worked out at less than £50 each for 5 courses and wine pairing!!). If you’re visiting Budapest and looking for somewhere to have dinner, please please go here! 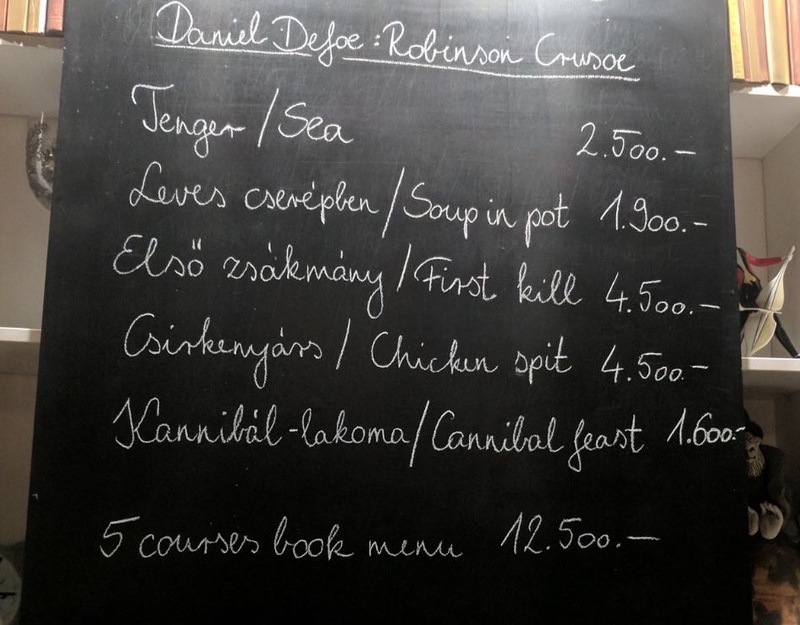 Credit to KönyvBár for the chicken picture as I got too excited and forgot to take a picture of this one!